Hamilton is a resort island currently owned and run by the Oatley family corporation, and there is very little room there for independent enterprise. This gives the whole place a slightly surreal and unearthly flavour, perhaps a bit like if Disney owned the Isle of Wight. 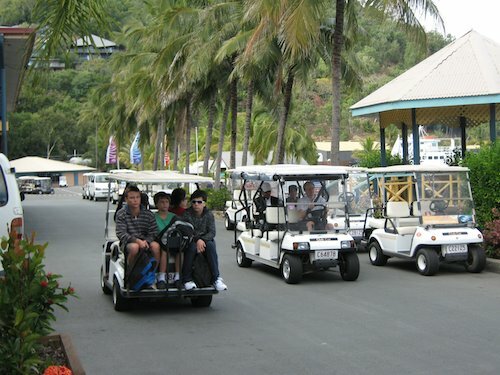 The road system is tiny, but everybody drives around in golf carts, which are provided to staff and hired by the day by tourists. Most of the restaurants and cafes are stamped with a lowest-common-denominator sameness, and it is slightly strange to keep meeting the same staff serving in each cafe. There is no beach on the island, so they made one by bringing in sand from Whitehaven and dumping it on top of rocky drying mudbanks in Catseye Bay. The effect is a bit strange if you look closely, and is anyway somewhat marred by the large amount of floating pumice that has since washed ashore… you can’t mess with geology. On the other hand, Hamilton Island is a pleasant enough place and everybody seems to be reasonably happy. Even the nightclub bouncers are friendly. Payment of your somewhat outrageous marina fee allows you to use any of the resort facilities, which is just as well as the official marina shower blocks aren’t really up to scratch. We were also lucky enough to be introduced to residents Pam and Bill (thank you, Nicky) who made us very welcome indeed and showed us some sides of island life that we would not have otherwise seen. And we drank a lot of wine with them. Oh yes. This entry was posted in Australia, Oceania, Travel, Voyage of Pindimara and tagged Sail, Whitsundays on 2009/07/20 by Reinhard.